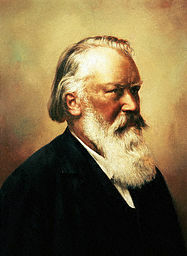 In an ongoing project, I am constructing distinctive real-time listening guides to the works of the German Romantic composer Johannes Brahms. By nature, the guides are recording-specific, but they can be adapted to any recording of the given works by simply changing the timings. I am willing to do this for anybody who would like to provide a recording. Email me if you have any requests for specific guides for works that may not be posted or for guides tailored to alternative recordings. The most recent additions will be marked as NEW! for at least a week. NOTE (6/15/14): I should have indicated long ago that I can no longer take requests for specific guides, and I have not done so for some time. I have explained to some people who have emailed me that it is just not feasible, and that it is best to stick to the random order I generated long ago. The guide you want will eventually be available. The site should be finished in the next 2-3 years. 84 of 122 opus numbers have now been done. For whatever reason, I have not changed this introduction since 2006, and I really should have done so. I AM still willing to tailor EXISTING guides to alternate recordings (with changed timings), although with the new public Spotify playlist, this should not usually be necessary. 6/17/14: In the almost ten years since beginning this project, it has been a personal labor of love. It has been extremely gratifying to hear stories of people who enjoy what I have done and find the guides useful. It has been even more satisfying to see my work here cited in various papers and projects. But this is a labor-intensive project for which I receive no material benefit or compensation. The guides are and always will be free to use and to cite (as long as I am properly credited), but I feel that it is finally time to drop this little button onto the top of the site. If you feel that my continuation and eventual completion of the project is of value to you or to others, please consider helping me out. Two days ago, I publicly announced (above) that I would not take any requests for guides. However, for any donation of $20 or more, I will immediately drop what I am working on and move directly to a work of your choice from the 38 remaining opus numbers (no WoO numbers at this point). First come, first serve. Guaranteed completion within ten days of the donation or, if somebody is ahead of you, within ten days from the point at which the previous guide in the queue is completed. Thank you in advance to anybody who is moved to help. Opus 91: Two Songs (Gesänge) for Alto with Viola and Piano [April 8, 2019] NEW! 1. Completely revised the guide for Op. 84, Romances and Songs for One or Two Voices, adding timings for a duet recording. 2. Went through all guides and added internal links, as I had started doing with earlier opus numbers in 2015. I may have been a little obsessive with this, and there is certainly an element of overkill (many repeated internal links in the same heading, etc. ), but I don't think the links are distracting from the text (they mainly appear in the introductory paragraphs). I created “dummy” pages for opus numbers where the guide does not yet exist so that I could simply add all the links at once. 3. Fixed all the dead score links after Op. 84 and added score links to make these later guides consistent with the earlier ones, particularly with the addition of alternate keys for solo songs. Added links to the IMSLP work page for the later opus numbers after Op. 84. 4. Fixed all the translation links, changing them from recmusic.org to lieder.net to avoid a redirect. Emily Ezust’s site has permanently migrated. 5. Moved all the updates on this main page to the archive, which was long overdue. 6. Made every attempt to bring every guide to the same state as far as consistency in links to scores, translations, formatting, etc. Granted, there are some guides from 2008 that could possibly use a revision (for example, Op. 101), but none of them are in the state that that the 2006 ones were before revision, and Op. 84 was a relic of that. I would want to finish adding the remaining opus numbers before doing any further revisions. I probably should update the header to the page and move those comments, but that is something that can wait, perhaps when the opus numbers are finally all available. And in upsetting news, last July all of the Fischer-Dieskau/Barenboim song recordings disappeared from Spotify in the United States. The DG complete edition was essentially withdrawn, and most of its recordings were assigned to other album art, but the Fischer-Dieskau songs were removed (the Jessye Norman ones are still available). I inquired about this with Deutsche Grammophon, and while they wanted to be helpful, they really didn’t have a good answer as to why the recordings had been removed or when they would be available again in the U.S. They told me to be patient and wait. This obviously leaves a big hole in the playlist. I hope they will come back. I believe most other recordings on the playlist are still available, although I may need to find a new one for the Op. 16 Serenade. Finally, I really do have to ask for donations again. I hate to sound desperate, but the guides are available freely for anyone to use. The hosting, which was once included with the domain, is now no longer bundled, and I pay a monthly fee for it. And last May, I was forced to resign my position as classical music writer for the Daily Camera. If the remaining 34 opus numbers are to be completed, the site needs to generate real income. With only 27% of the opus numbers still remaining, I can still prioritize missing works that donors would like to see (if the donation is $20 or more--$50 would be preferred for this), but I also have to give some of the lesser remaining works my attention. I think that’s all for now. Thank you again for all of your encouragement and for your patience in the years of inactivity. All guides copyright 2004-2019 by Kelly Dean Hansen. Feel free to use them in any way, but please give me credit.